In recent months, I have been emerging from a complex season of loss and grief. The feelings ebb and flow, come and go, and mix and mingle with joy and gratitude. This grief experience is common to all humans, if we live long enough and are honest with ourselves. No one escapes. The catalysts are many – from the death of one we love, to failed relationship, to dreams unrealized, to watching people we love make self destructive choices, and on and on and on. But what we do with these experiences can take many a path. I am slowly meandering my way through a challenging and insightful book by Brene Brown, author and researcher on vulnerability, courage, worthiness and shame. The Gifts of Imperfection is full of research-based information on people who live full and satisfying lives – something Brown refers to as a “wholehearted life”. I am finding this book both fascinating and hopeful. One section that particularly caught my attention and has traveled around inside my heart and mind for weeks now is best summed up with this quote, “There is a full spectrum of human emotions and when we numb the dark, we numb the light.” The temptation and desire to numb the dark is a very real one. The methods of anesthetizing our painful feelings are myriad – busyness, substances, doing good works, electronic distractions, over-eating/exercising/spending…, and the list could go on and on and on. As I’ve lived through recent months, the truth of this finding has shown itself. During grief’s most intense visitations, I sometimes fight back and just want the feelings to go away, NOW. When I battle them with a vengeance, I either wind up in a very anxious place or a very numb place – with the side effect of missing out on the beautiful gifts of peace and joy. But when I am willing to sit with loss, give it space, be honest about the source and shed tears of sorrow, there is ultimate cleansing and healing power. It is exhausting yet freeing in its’ own way. It takes even more energy and anxiety to push down, hold back, or shove away such raw human emotion. Fleeing from and numbing the painful emotions resulted in the unintended consequence of also missing out and desensitizing myself to the beauty and joy all around. In the realm of American Christian faith, there seems to be a prevailing attitude and hope that we can and should experience all of the beauty and joy of life without the sorrow and grief side. And if we can’t put on a happy face, then often our faith is questioned. I am not exactly sure where that idea came from – after all Jesus lived the entire spectrum of emotions. There could be no resurrection without crucifixion. So I am learning that in order to deeply experience the joys of life, I must be willing and intentional to feel the disappointments, sorrows and grief of this journey. “Joy is as thorny and sharp as any of the dark emotions. To love someone fiercely, to believe in something with your whole heart, to celebrate a fleeting moment in time, to fully engage in a life that doesn’t come with guarantees – these are risks that involve vulnerability and often pain. When we lose our tolerance for discomfort, we lose joy”, says Brown. I have to say I agree. We can’t have one without the other. As a child, most of my growing up years were spent in South Florida. At the age of 18, I headed north on I95 to attend a liberal arts university in “the south”. At that point, I had never heard of the Mason-Dixon line – if I had it was in the context of a war that was long ago over and done. I soon realized that there was a distinct view of history and culture in this part of the country. That was over 30 years ago, yet there are still many things southern that elude and confound me at times, despite spending most of my adult years living here. 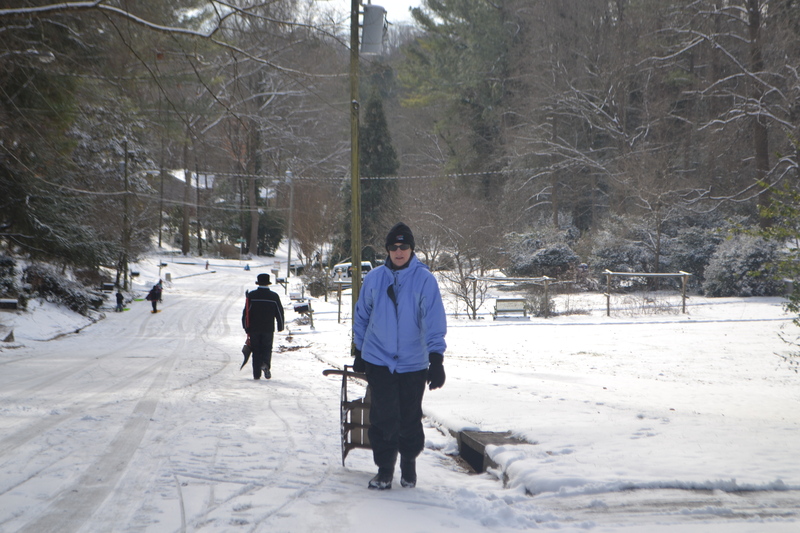 But one thing that I have almost whole heartedly embraced is the southern snow day culture. Two weeks ago this ritual played out in our home. The first phase is an almost incessant weather checking as forecasters predict the possibility of white stuff falling from the sky. Even though we did not need one thing from the grocery store, on the day of the predicted snow, I found myself standing in line at the check out with fun snacks and special treats. Thankfully we were not in need of milk or bread – those shelves are almost always completely wiped out by the few hours before a predicted snow fall. I was late to the game this time, but as I know the drill and somehow wanted to preemptively address the cabin fever on the horizon, my adrenaline was high as I gathered up the bags and headed home. 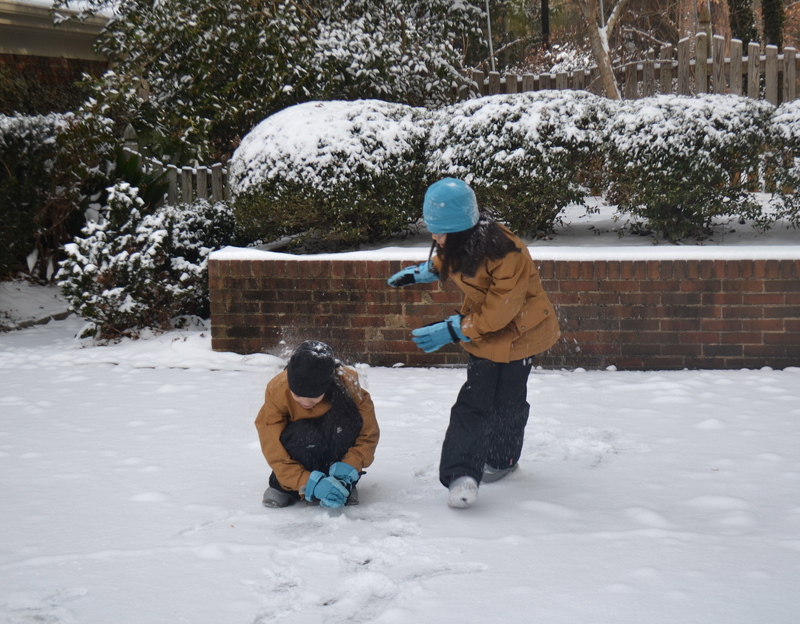 Due to a fear of an Atlanta-type city gridlock, school is often cancelled before predicted snow begins to fall. This is always a challenge and frustration for many a parent. We know what may be ahead, so we want to make sure the children get every possible hour of school so that we can prepare for the days of no school that may be looming. The waiting for the snow to start hours are full of excitement, anticipation and a time to read, relax and often play together. 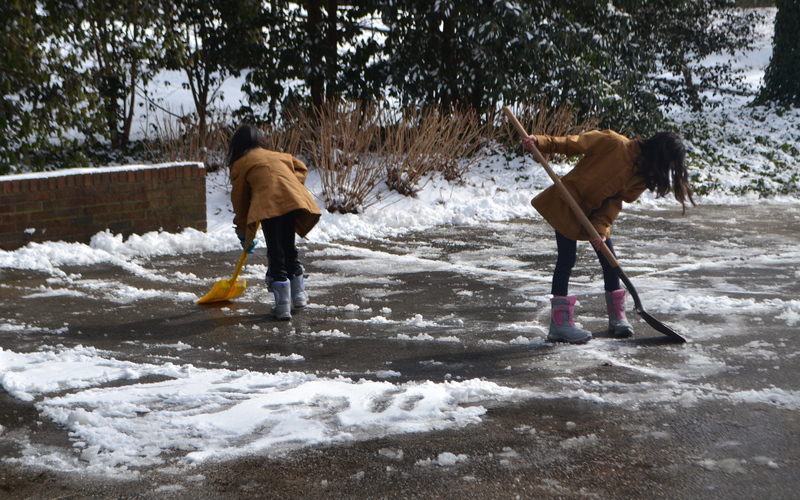 And when those first flakes start to fall, the children are excited, have a Christmas eve like difficulty falling asleep and often rise very early to see if in fact the snow did come. The morning peek out of the window is a critical moment. It is a huge disappointment if the forecasters got it wrong this time but a great delight and joy if the world is blanketed with white. After a quick breakfast, and sometimes before, snow gear is cobbled together as it is time to head out and see if this is going to be one of the every few years events that can involve snow men, sledding and wandering around in a beautiful winter wonderland. 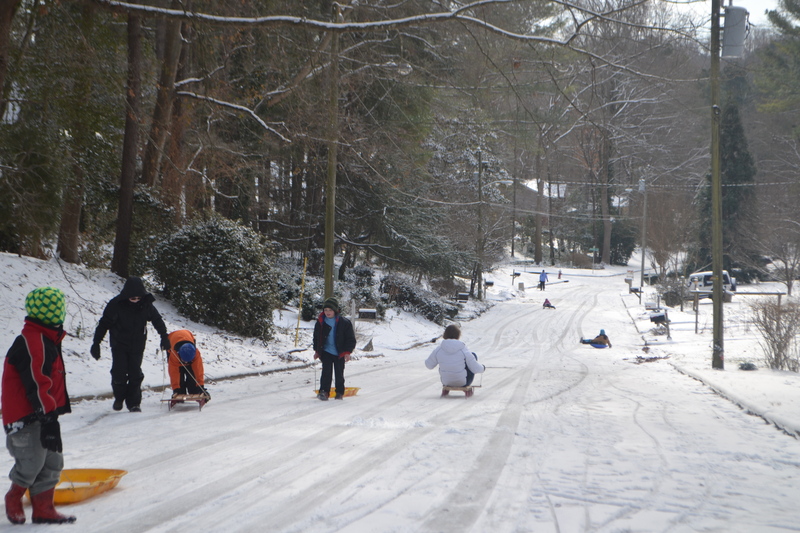 When it is one of those jackpot kind of southern snows, the ultimate destination is the neighborhood’s best sledding hill and gathering place. This becomes a place to connect with neighbors, stand around a trash can fire and zip down the hill. Anxious parents watch children who are not particularly adept at steering and getting out of the way of oncoming sliders. We try to quickly teach safety and steering as we also feel the joy of childhood and jockey for our own turns to fly down the hill. When the hands and feet are cold, we hike back home, sit by the fire and enjoy a big cup of hot chocolate. After refueling, if the snow is still around, we think about driveway clearing or getting in another run down the big hill before the sun begins to melt the fun. 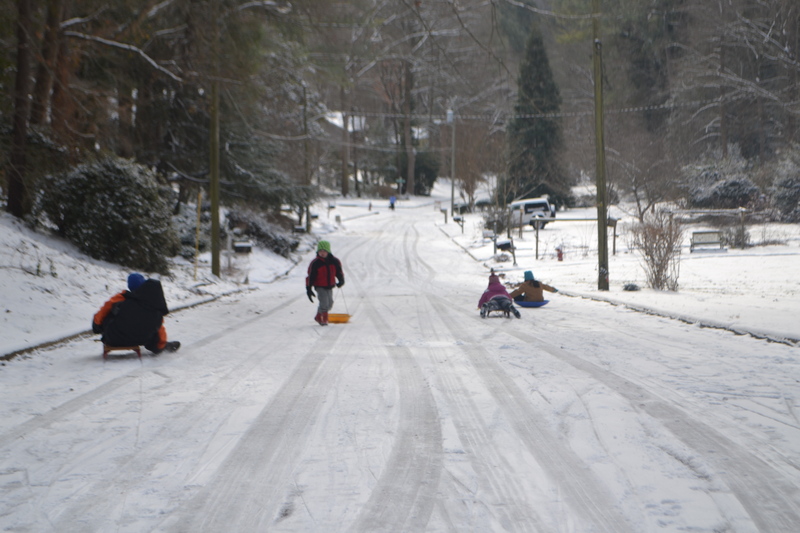 Very often, the big thaw begins to happen, cars start to move down the sledding hills and we start to wonder how many days until the streets are safe enough for a school bus to roll down them. If the temperatures dip down at night, we know that it may be days before routine life returns. We get antsy – parents and children – and look toward more routine days and wonder how many make up days will cut into summer or spring break. 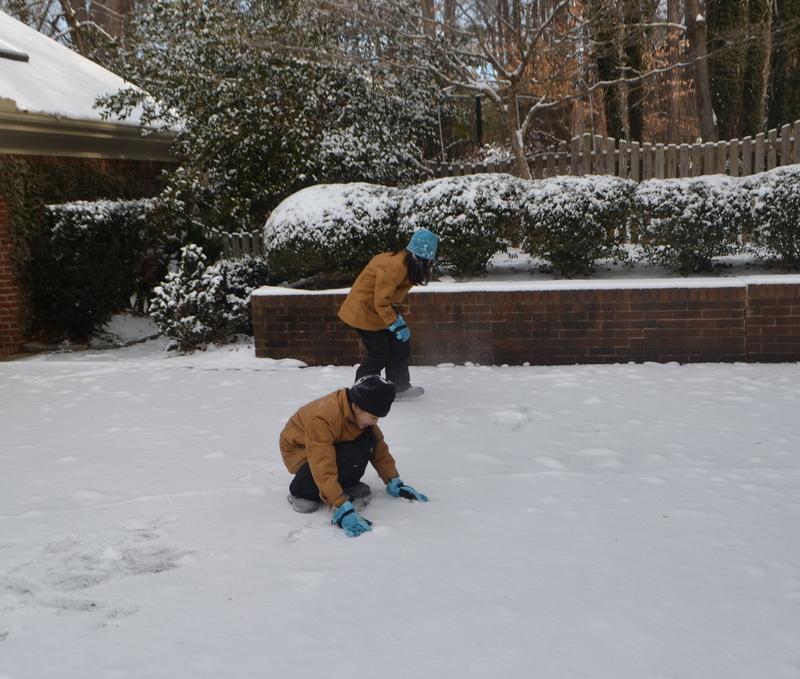 There is something quite peaceful and free about the first day or two of our southern snow days. Much of the city and hectic schedule just stops and offers a forced slow down and enjoy the moment opportunity. It is a time to anticipate, hope, laugh, play and at times just relax and be together. When these events last several days, we collectively long for routine and “normalcy” all together. Once again, snow is in our forecast. I wonder what the next several days will bring. First though, I am heading out to the grocery store.